Image caption Mr Buffet said local papers were "important institutions"
One of the world's best known investors, Warren Buffett, is investing in local newspapers. 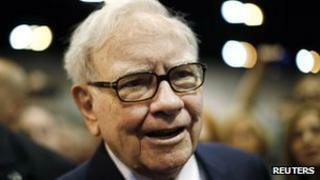 His firm, Berkshire Hathaway, is paying $142m (£90m) to buy a controlling stake in Media General, and will also loan the firm $400m and extend an extra $45m flexible credit line. Media General owns 63 daily and weekly newspapers in the south-eastern US. Berkshire already owns owns the Buffalo News, the Omaha World Herald and a stake in the Washington Post. The investment comes at a time when local newspapers in the US are under financial pressure. Many are suffering falling circulation and losing advertising revenue to new digital media. But Mr Buffett is confident that some papers can prosper. He said: "In towns and cities where there is a strong sense of community, there is no more important institution than the local paper. "The many locales served by the newspapers we are acquiring fall firmly in this mould and we are delighted they have found a permanent home with Berkshire Hathaway." Media General has newspapers in Virginia, North Carolina, South Carolina and Alabama. In the past Mr Buffett has been pessimistic about the outlook for the local newspaper industry. Three years ago he told shareholders: "They were only essential to advertisers as long as they were essential to the reader, and that is changing." Nevertheless, he has recently been investing in local newspapers. In December last year, his investment firm bought the Omaha World Herald, his hometown newspaper, for $150m.